Note the title is not "Why I am voting for Mitt Romney." That's because the two major American parties, Democratic and Republican, represent contrasting outlooks and you vote for the one or other of them, not for a personality. The presidential candidate is captain of the team but its many other players act autonomously. The past half-century has seen a sharpening of the divide between the parties' philosophical consistency which I (unlike most observers) see as a positive development; who needs Rockefeller Republicans, wets, or RINOs? And ticket-splitting increases gridlock. 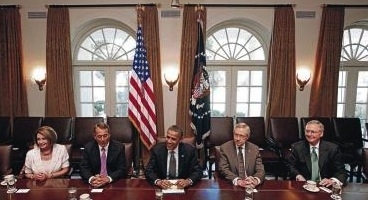 The president as captain of his team: Nancy Pelosi, John Boehner, Barack Obama, Harry Reid and Mitch McConnell in the White House, July 14, 2011. I vote Republican because I support the party's core message of individualism, patriotism, and respect for tradition, in contrast to the core Democratic message of dependence, self-criticism, and "progress." I am inspired by the original reading of the U.S. Constitution, by ideals of personal freedom and American exceptionalism. I vote for small government, for a return of power to the states, for a strong military, and an assertive pursuit of national interests. And on my special issues, the Middle East and Islamism, Republicans consistently outperform Democrats. Extensive polling and many congressional actions establish this pattern for the Arab-Israeli conflict and a similar contrast exists also on other foreign policy issues, such as the Iranian nuclear buildup, energy policy, and the Arab upheavals. As for the new totalitarian ideology, Islamism, Democrats show a marked softness, just as they previously did vis-à-vis the communist one. Finally, I worry that Barack Obama will do far more damage in a second term than he could in his first, that Obamacare will prove just the start of what, before his inauguration, I called the "fundamental restructuring of the relationship between state and society such as occurred under three of his Democratic predecessors of the past century – Woodrow Wilson, Franklin Roosevelt, and Lyndon Johnson."